Le panneau Bibliothèque affiche, pour tous les canevas de l'animation courante, l'ensemble des Noeud de Valeur exportés. Si, par exemple, vous utilisez une couleur encore et encore, c'est une bonne idée de l'exporter dans le panneau Bibliothèque, ainsi vous pourrez facilement la réutiliser. Simplement, cliquez droit sur la couleur dans le Panneau Paramètres et choisissez "Exporter" dans le menu. You will be prompted for a name to associate with the value. In order to see the newly exported value in the Library panel, you will have to open up the "ValueBase Nodes" tree if it isn't already opened. The same technique works for any other parameter as well, even for complete animated spline paths. To use a value that you have exported into the Library panel in a different layer, simply select the value in the Library panel then right-click the parameter you want to apply it to in the Panneau Paramètres. Select "Connecter" to use the value. The values stored in the Library panel store their animations with them. So if you have a circle whose color changes from red to yellow over time, and export that circle's Color parameter and use it to color a rectangle, the rectangle will also change from red to yellow over time, in exactly the same way. The color of the two shapes will now be linked, so editing either one of them will affect the other. 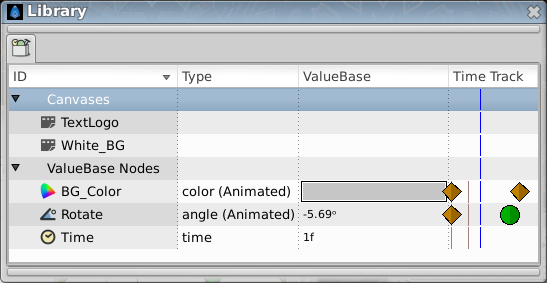 When a value is selected in the Library Panel, its handle will be shown in the Work Area Window. These handle will remain as you switch from layer to layer, which can be confusing. It is possible, using drag and drop, to organise the values in the Library panel into a hierarchical structure, but currently the structure you create isn't saved into the .sifz file, so any organisation you do will be lost when you next open the document. This page was last modified on 19 April 2016, at 03:27.